Much has changed in both schools and society since the publication of the 2nd edition of How to Differentiate Instruction in Mixed-Ability Classrooms. 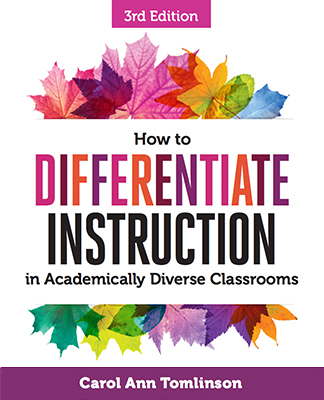 The 2017 publication, How to Differentiate Instruction in Academically Diverse Classrooms, 3rd Edition, provides an opportunity to look both back and ahead at the opportunities and challenges of developing classrooms designed to work for a broad range of learners. In this engaging webinar, author Carol Ann Tomlinson will share a few key foundational and practical revisions from the most recent edition of the book. Among the ideas she will survey are the reason for a (slightly) new title, why it's important to "teach up," specific guidelines for supporting particular categories of learners, and advice for appropriate use of learning styles in the classroom. There will also be time for questions from the field.